I have not written a blog post in a while. I almost replaced my blog with Facebook posts…but I realize it’s so important to stay connected by writing deeper, lengthier, more detailed facts about my journey to healing…as I am the living proof that miracles can happen, and I am also living proof that I am human, and mistakes can happen (are they really mistakes or divine guidance to lessons?) that will slow down my healing as last week I did not receive the news I expected. I feel one of my gifts through this journey that I can give others are the lessons acquired through my pain, the challenges I find along the way…and hoping to sprinkle seeds of goodness as I learn to master my journey…to sprinkle love to the world as others cross the bridge…to give a helping hand and reach out to those who may be scared to take the leap…I made this blog for you. And any of your friends who may be experiencing pain.. I recently got back from an incredible journey in Mexico, where there was so much love. So much creativity, so much possibility and I was around so many amazing people. 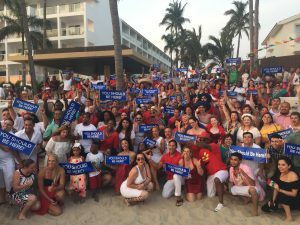 Dave and I created the first ever Luxury Hotel takeover by a group in DreamTrips, as part of our 7thPower elite travel club within DreamTrips. We took every single room in the hotel, all 150 rooms with almost 400 people. 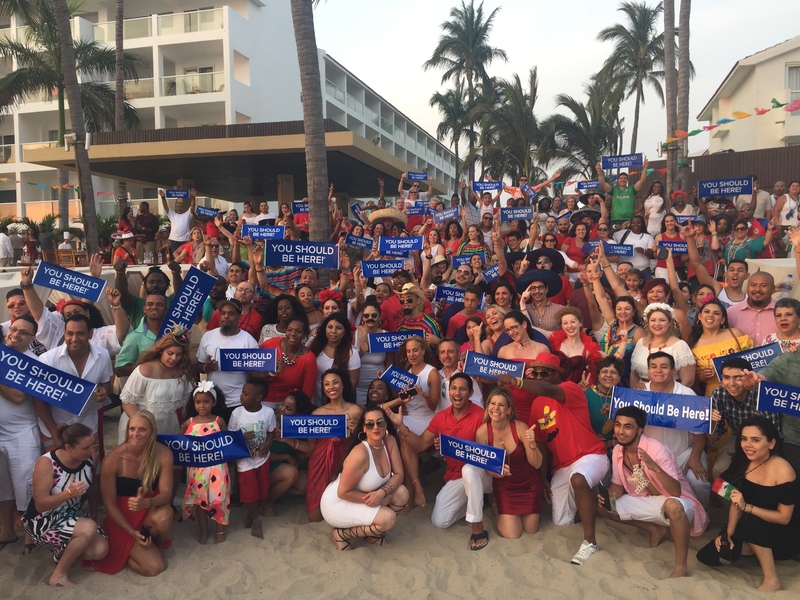 We created an incredible experience for everyone, with welcome parties, mariachis, masquerades and lots of surprises. The Chef from the Four Seasons Beverly Hills is the executive chef at this resort and prepared the most delicious dishes that would melt in your mouth, from breakfast to drinks at sunset. Everyone had the most incredible experience. I came home fulfilled. Happy. In love with everyone and happy to have the coolest job in the world…helping people experience magic. And I came back exhausted. I mean I hardly slept, we were giving 150% of us, from every activity, to people’s love for us and wanting to spend time with us, to marrying one of my great friends, to even teaching a seminar BreakThrough! Mexico to almost 200 people there. One of the things I’m realizing in my journey is how much I tend to overwhelm myself to make sure everyone else is okay. Sound familiar? As women (and some gentlemen too), we tend to take care of everyone else and deplete ourselves. Our brains are wired this way, so when we have a child, we will take care of that child’s needs before ours. Make sense, right? If you are a lady reading this, will you comment below and let me know how it is that you deplete yourself and what you are doing to change that — to truly take care of yourself? what are the things that fill your soul? What are the things you would do if you had more time? For me it’s yoga, the ocean, running, meditating, praying and walking. Today I had a really tough day. And very interesting. I went in to get my results from an update scan. And I was excited. I have been doing all the right things and after my first 90 days with alternative healing between another country and my amazing team of doctors here, I had a 41% reduction in my tumor, so I knew I would get better results. I was expecting 85 – 90% improvement. I was ready for the big celebration! After speaking to my momma for a long time today…and so many times I pour on others and run on an empty cup — it felt so good to have her love and feedback…in the last few weeks she has become a huge fan of Hay House Radio and she had heard a gentleman Dr. Bruce Lipton in an interview. In this interview he talks about Epigenetics (he has already proven to the world that belief systems and environment can change your genetical pool, even citing examples of adopted kids who had nothing to do with the blood line and end up getting the same kind of rare cancer as their family members). He also talks about how it has been proven that stress can shift your gene pool and completely take away from your healing. Listening to his website yesterday I received even more information, because I was wondering how it was that I got 41% reduction in a tumor in 90 days and only 10% in 6 months after that. All this of course, being a HUGE HUGE miracle, as there is no known cure for ameloblastoma, and definitely no cases in the world showing any type of reversal! I will prove everyone there IS!!! Well, when I was out of the country receiving this special alternative treatment which I will mention in a different blog, not only was I changing my environment completely (no pollution, healthy unprocessed foods, relaxation) but I was also alone and for a big part of the day I would be praying, meditating, journaling and soul searching. Some days as many as 8 hours I spent in the park or the church praying and asking and getting aligned with my intentions. When I got back and got such great news, I became a little overconfident (please hear me out: sometimes the worse part about success is “a little bit”) and I stopped doing some of the things I was doing prior that caused my success. I said “I got this” and sometimes the worse three words in the vocabulary are “I know this” or “I got this”. The FANTASTIC news I received is that the thickness of the ameloblastoma tumor has reduced another 10%. That was the most dangerous part because the tumor was eating away at the bone and one day I would chew and my jaw could break. Not only has the bone regrown, but the ameloblastoma tumor was been coated by bone again which is a miracle in itself. Bone doesn’t just regrow, specially in situations like this. Usually it just de-calcifies and in my situation, it grew back all around the tumor! So I am celebrating that miracle big time! And now…it’s time for a tune up. Most people when they enter a healing journey they are not aware that it’s not just the physical. It’s also the mental and emotional part of the journey, the stress, the trauma that caused pain in your life that also affects your body. For five years all I focused was on containing or healing the physical aspect and I failed miserably. Then I started expanding my knowledge. Researching other miracle healing. Listening to doctors who told me ” I Can” vs. “you just need to get your jaw removed and bone transplant from your leg.” This quest for information saved my life. Listening to Bruce Lipton in his free audio after you submit your email on his website, he says that there were studies that are proving that people who are in at least 8 hour meditation a day were able to shift their healing focus to create a miracle. In this study it was specifically for 8 hours a day, but he dares to say that it could be created in a short amount of time. Now the debate over meditation and prayer always rises. For me, they are different and you need both. Prayer is the act of asking your Creator and communicating with him. Meditation is the act of quieting your mind so you can listen to the whispers of spirit and God’s journey for you. Meditation is the art of relaxation and connecting your body and mind to your soul’s journey on this earth. When I was out of country I was doing this pretty much all day, because I had nothing else to do. Then I returned and my passion for people, but also my inability to relax and just be (and believe me, I”m learning big on this one), even though my incredible husband Dave Ulloa took on all our business endeavors to give me time to heal, I still found the way to step in and take on “smaller projects” that became giants like taking 400 people to Mexico for a DreamTrip Ultra 7thPower experience. This week I was really down because of the scan. I gave myself a couple days to “mourn” the results and then picked myself back up. I decided to resort for sunshine and doing something different, like bike-riding in the beautiful California sun, from Venice to Sta Monica. I’ll do another blog on this one, but I got huge lessons when I fell and ended up in the ER. Any time something intense happens that forces you to pause, ask: why am I being forced to stop, pause, slow down. I pretty much got my right foot (which I use for everything) completely stalled, in crutches, unable to move. Then my lesson showed up: if you want those same results you must go back to doing the things you were doing at the beginning. Nurturing yourself 100% of the time…loving yourself, honoring yourself…reading inspiring books…surrounding yourself by people who love you…and I got the lesson. I can’t serve others with an empty cup. I love you all…and thank you for playing full out!! This entry was posted in Ameloblastoma, Healing, Inspiration and tagged alternative healing, ameloblastoma, Behive of Healing, Dave Ulloa, Dr. Sadeghi, healing blog, holistic healing, Yvette Ulloa. Bookmark the permalink. Your lessons are enlightenment for all of us. Prayers and blessings with you always. ??? I am a mother of 6 so I’ll spare you the details of how much I neglect myself for putting everyone else first. But I will say that I suffer a chronic illness and have also chosen a holistic approach (I am so excited for hitting IMD so that I can afford to go to the same place of healing you went to, it looks absolutely GORGEOUS) over the medications prescribed by my team of rheumatologists, and have noticed that when I specifically carve out the extra time to meditate I hurt less. I pray regularly but I agree, prayer and meditation are so very different. You inspire me to continue ahead on my journey for my children. The pain I used to feel is gone and what is in place is a 70% reduction! I will take it, thank God and continue to seek healing in my food and natural supplements. Thanks Yvette, for sharing your most personal struggles with the world. Those of us with whom your message resonates, appreciate your transparency. Yvette, Thank you for sharing your life journey through this difficult and challenging time and for giving me a lesson in humility and gratitude. It is amazing that we are sent messages and inspiration in our own difficult times; through the most unexpected channels. I needed this lesson today and I wish you the very best as you continue to inspire and motivate others!! I’ve learned here that one cannot serve others with an empty cup. Yvette, thank you for sharing your journey. As for me I am working on surrendering all my hurts, habits and hang- ups to the Lord. The ones that do not serve me in a good way. In exchange for all that He created me to be. love you so much and thank you for sharing so transparently. Through your stories, I am learning about myself and my own journey, I am grateful for you for that. I have found out the hard way of not listening to my body when I am tired and needing to stop, lay down and rest. Chemo has stripped me of energy at times and this has been very hard for me to accept. After spending last weekend in the hospital from dehydration and exhaustion, I realize the need to take care of myself. Your post has confirmed this! Thank you for sharing your ups and downs. In February when I was diagnosed with colon cancer I was so scared but put my fear into gods hands. Was hard but have told my family I have to come first right now. Something I have never done. Trying to eat better, get plenty of rest, light exercise. Stayed positive or tried my hardest to. There have been set backs that try to make me give in to it but I refuse. You foot story is telling you to make a decision and take time for yourself. We all know what an amazing person you are, when Nelis and I went to our frost WV meeting, you and Dave introduced us to so many people it was amazing. We were not used to this as we are not in your structure but you life the WV policy of one big family. Your health is no your priority….you will prove many that there is a way. Thank you Nicky for your beautiful words! Sending you so much love! Bravo Yvette. Thank you again, and again and again for sharing your journey. We are brought up in a society where we are expected to “toughen up” and not show our vulnerability. I know it was (and probably still is) a challenge for you to share the deeper details of this very personal and intimate journey and I take my hat off to you for the incredible strength to share your weakness. That is true courage. Thank you Yvette for you wonderful, honest, heart warming share. I am very inspired by you and your ability to see the rainbow in all situations in your life. You are an amazing woman and although our paths have not physically crossed, I truly feel blessed that you are in my life. Focusing on me and my health in the last year has been a wonderful shift for me, thanks for the reminder to do 100% of the time. Sending you positive blessings on your path… THANK YOU FOR BEING YOU. Thank you Ocean for these beautiful words! I look forward to meeting you and I’m very proud of you for filling your cup and making your health a priority! You can be so much more for the world if your cup is full! I continued to be INSPIRED by you Yvette Ulloa!!!! ♡♡♡♡♡ u sweet lady!!! I feel so blessed that you (and Dave) are among the souls I get to travel with–I’m so grateful that our paths crossed in wonderful WorldVentures. Yours is one of the main blogs I read (referred by mutual friend Roe DeSaro) once I was diagnosed with Stage 4 lung cancer with small chance of survival. You referred me to kriscarr.com who also became a valuable resource. Largely through changing my S.A.D. diet (I now call live-it), sleep, exercise, prayer and meditation, biomat therapy, positive friends, acupuncture, and massage, the cancer became undetectable in less than 3 months. (live-itup.com). Now 3.5 years later the blood tests still register it undetectable. My 20 years of rheumatoid arthritis also disappeared, and 60 pounds of excess weight. Miracles happen, and I’m so inspired by yours. I’m sending you mountains of uplifting positive vibrations to help you through your current ‘gift/lessons’. A few months ago was the 22th anniversary of attracting my dream (loving, young, strong, handsome) husband (who was living in poverty raising his 2 little boys) and we celebrated in our 5-year old guest house villa in Jamaica which my husband built (I had visioned it in 1979 for my retirement). I joyfully claim to be the original ‘Stella who got her groove back,’ and am now finishing a book about the amazing journey. I had both knees replaced 2 years ago and both grew scar tissue on the implants; arthroscopy removed it after the 3-4 months of walking didn’t dissolve it. Then, which is rare, it grew back again on my right knee; just got another arthroscopy and am working slowly to heal and strengthen the muscles. I’m very grateful I can walk even though I am still challenged with going up and down stairs. More lessons to go through. I like to imagine that the spirit/soul chose this life to experience difficulties that ‘crimp my style’ at least so I have more empathy for others in pain. Clearly my spirit/soul has remembered enough of the power available to us through our Source to enable my body to heal from it’s imbalance that brought forth the cancer as a last resort (cancer cells, we know, thrives on (and thus eliminate) excessive sugar, acid and toxins). It also miraculously healed a squashed vertebrate that had been precariously sticking into my spine. Give thanks and praises. Thank YOU so much Yvette; I remember getting to hear you in person in NJ years ago talking about your journey and the beginnings of your healing and learnings from it all–so, so inspiring. I hold your hand in sisterhood knowing that All is Well and All will be Well. One Love. Hello, I was diagnosed with a Desmoplastic Ameloblastoma in July of this year. Back in 1999 when I was 20 I had a cyst removed that came back an Ameloblastoma with a come back rate of 3-7% in the following 10 years. There wasn’t any follow ups done by my oral surgeon or my dentist besides the normal bite X-rays. Jump ahead to now, I moved to another state last year and started seeing my new dentist in April of this year. On my first visit they asked if anything was bothering me. 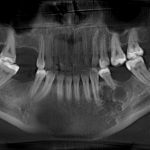 I told them that I had been noticing a difference in the area with a lot of pain for the past 3 years or so but that my dentist had said that they didn’t see anything on the bite X-rays. So my dentist now decided that a pano was a good idea. Thus is how this was rediscovered. Except through a biopsy was diagnosed desmoplastic and it has eaten away a good chunk of my jawbone completely away. My oral surgeon now of course is wanting to do the same procedure but all at the same time. I have been doing things naturally making me almost 100% pain free! That was exciting and encouraging. Now I believe I have just been controlling the pain not actually shrinking or stopping the growth. I too am faced with the decision of surgery or continue naturally. Really trying to hear the Lord’s voice and leading as to which way to go. I have 5 kids, 14 down to 1 in age. I homeschool, have no family around, and my husband travels. Finding time to destress and do things for myself is almost impossible. I have been told over and over to cut stress, eat right, pray and meditate. Easier said then done. Going to have to figure it out, surgery or not. Thank you for your testimony…..I felt like I was reading my story in the beginning. I have been told as well it possibly was wisdom tooth that didn’t develop as I don’t have any wisdom teeth which I feel is a blessing. I will continue to follow your journey as I travel my own. Any words would be great.